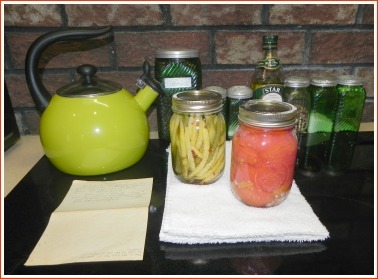 Pickled beans and canned tomatoes--today's fruits of the garden and the joy of remembering and doing. I’ve been itching to do some canning. I have been waiting since last summer, when I found how much I enjoy the entire process, from the picking of the vegetables to having them sealed tight in the jars. There’s a pleasure in the skill (or art) of doing each step that finishes with the colorful beans, okra, cucumbers, or tomatoes glowing brightly through the shiny glass. So today was just the day to do some canning–really not so unlike those summer days on the farm–with a blustery south wind blowing and the thermometer reading in the 90s. My beans have been doing well, even though I wish I had planted another row. I can pick some every day, but I do have to save up to have a mess to cook. The tomatoes are starting to ripen at a rate faster than I can eat them fresh. This morning I had more than enough beans and tomatoes to can a pint of pickled beans and a pint of tomatoes. By the looks of the garden, I’ll be able to do more of the tomates soon, but it really doesn’t matter how many jars I can make at one time because for me, there’s joy in the just the doing. Part of that pleasure is that I always have to go through my recipe box. I don’t have much organization to it, so every time I’m looking for a particular recipe, I have to shuffle through them all. But that’s part of the fun too. It always a nostalgic journey. Some are for cookies or cakes I made when I was a kid in 4-H. Some cards have recipes cut from the newspaper and taped on the cards. Some are in the handwriting of friends or family members for some dish they had made that was so good that I had asked for the recipe. Quite a number, like that for canned tomatoes, were written down for me by my Mom. Just to have that recipe in her own handwriting is something pretty special, now that she’s no longer around to talk to or write down anything. My canning this morning went without mishap. I bought a new pot for the water bath process. It’s deeper, but not as wide as the one I used last year; consequently, it heats faster and the jars are easily covered by the bubbling water. I’m hoping the garden keeps producing so that I can add more pickled beans and tomatoes to these couple of jars. Clip the stem ends from the beans, which have been washed. Try to use the straightest beans that you have for pickled beans. Fill a heavy kettle with enough water so that jars will be covered by about 1 inch of water when placed standing in the water. Heat the water to boiling. Meanwhile sterilize the jars in another kettle with a couple of inches of boiling water in the bottom. Place the jar lids and the jars in the boiling water. Remove the clean jars and place on a clean towel near where they will be filled. Leave the lids in the hot water until you are ready to seal the jars. At the same time, heat the vinegar, water and salt to boiling in a saucepan. Put the fresh dill, red pepper flakes, peppercorns, and garlic in the jar. Then start to pack the beans into the jar by holding the jar on its side and placing the beans parallel to each other lengthwise from the bottom to the top of the jar. Carefully pack the beans as tightly as possible into the jar, making sure that the end of each is at least 1/2 below the mouth of the jar. Place the jars in the boiling water. At this point you will need to adjust the heat because the cooler jars may stop the water from boiling. Once the water begins to boil again, adjust to just a good simmer and cook the beans for 10 minutes. Take the jar out of the water and place on a towel to cool. When the jar has cooled, check to see if the lid has sealed by gently pushing down on the lid with your finger. If the jar is sealed, there will be no “give”. If there is an up-down movement, then the jar has not sealed. I have sometimes sealed jars by sterilizing a fresh lid, making sure the mouth of the jar is absolutely clean, and placing the jar backing into the boiling canning kettle. However, with more experience, it is a rarity to have a jar not seal. Therefore, in order not to overcook pickles, it is better just to put any unsealed jar with the lid and ring hand-tightened in the fridge for a couple of weeks and then try them! Stored jars of pickles and other canned items on a cool dark shelf. 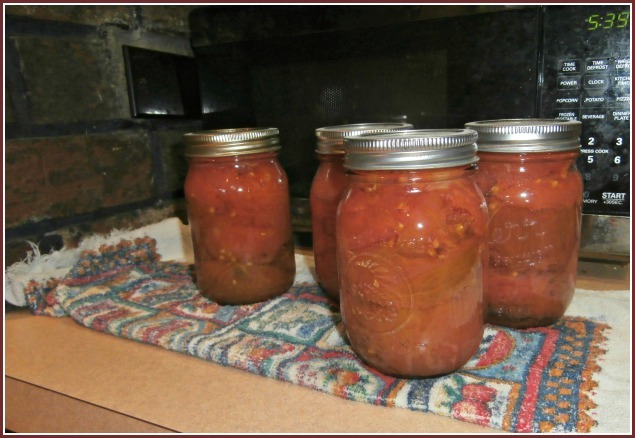 Mom's recipe for canned tomatoes--nostalgic and delicious. 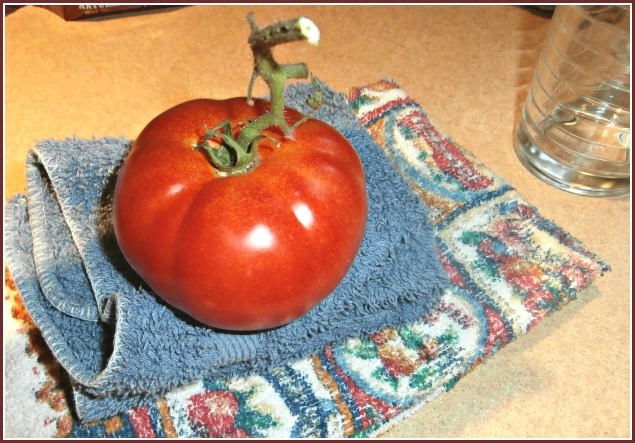 “Scald tomatoes for a few minutes, then put in cold water. Peel & pack tight in jars. Add 1/2 tsp. salt for pints, 1 tsp. for quarts.